With the second overall pick in the 2017 NHL Entry Draft, the Philadelphia Flyers would like to select… Nolan Patrick. Remember that moment in a few years. Looking back on past drafts, top three picks are hit and miss as to whether they have an immediate effect or whether they will develop into the player they’re projected to be. Despite world-class scouts, there is no perfect science for evaluating a player’s upside. From the time these kids hit 16 years old, they’re on scouts’ radars. They dominate their minor hockey systems and then enter the major junior and some immediately continue their success while others have to reevaluate their play against tougher competition. All eyes are on them which makes every mistake more significant. 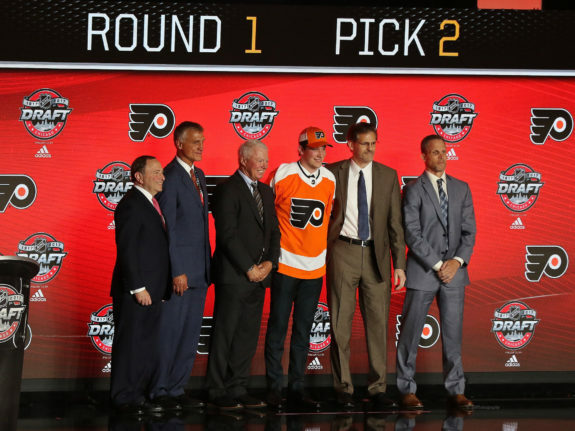 When the Flyers won the lottery and moved up to number two in the draft, they knew they were going to have a great player with either Nico Hischier or Nolan Patrick. 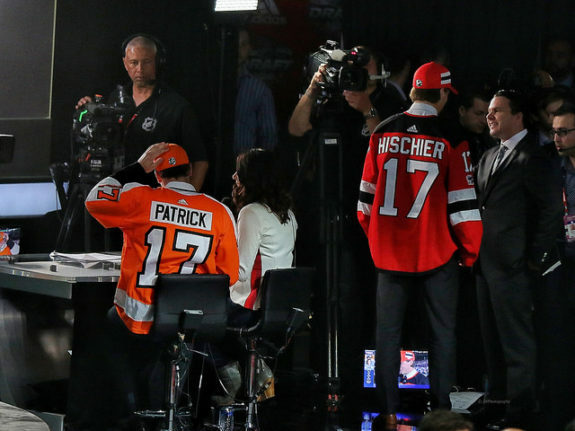 After New Jersey decided to draft Hischier, it was Patrick who was left on the board for the Flyers to select. The Devils went ahead and selected Hischier despite the fact that many scouts had predicted Patrick to go first overall for the majority of the time leading up to the draft. A skeptic would say he is not having a great season, but if you dig into the development we’ve witnessed, he is having a solid season. As soon as Patrick fell to the Flyers, Ron Hextall knew he had a future number one/two centreman. Late into the round, he dealt Brayden Schenn to the St. Louis Blues to clear a spot for Patrick. Schenn’s being selected to the All-Star team is a tough pill to swallow, especially since he’s producing at nearly a point per game and is on pace for a career year in points, goals and assists. However, when you take into consideration that Patrick likely would have been kept in junior this year had Hextall stuck with Schenn, this move was good for the future of this team. While Patrick is not racking up mass amounts of points as some would have hoped for out of the gates, he is holding his own. He is a 19-year-old kid who is playing above his years of experience. 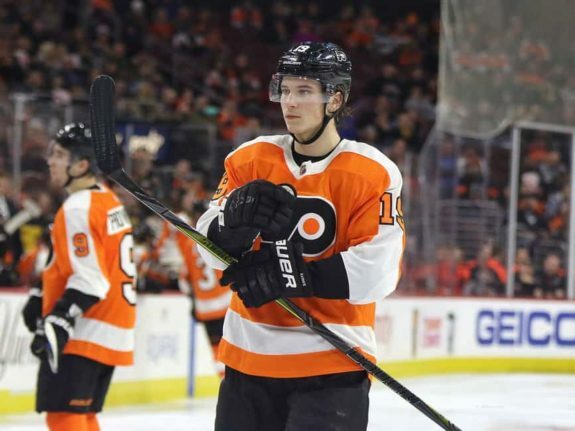 His position in Philadelphia is unique because while fans hope he becomes the go-to guy soon, the Flyers have a lineup full of solid players that take a bit of the pressure off Patrick. He currently has three goals and six assists for nine points through 40 games. Patrick has shown glimpses of greatness this season playing throughout the lineup in a variety of roles for head coach Dave Hakstol. If the Flyers develop him correctly, they could have a solid number one/two centreman. The big talk at the draft was Nico or Nolan and who was going to go first overall. It’s easy to look at Hischier’s numbers and say that Patrick, in comparison, is having a bad season. That is an unfair comparison because both teams are in different situations with different opportunities available. Patrick has veteran centres such as Claude Giroux, Sean Couturier and Valtteri Filppula ahead of him whereas Hischier only has veteran Travis Zajac ahead of him on the depth chart. Hischier is expected to contribute every night because he is consistently up in the top-six and is supposed to be the savior for the Devils. Patrick doesn’t have to deal with that additional pressure in Philadelphia which is helping him develop by doing the little things correctly. Whether it be a big faceoff win or getting the puck in deep for a line change, he is doing all of these things well. Similar to Crosby vs Ovechkin and McDavid vs Eichel, the Nolan vs Nico comparisons will never go away. In saying that, you still have to look at the numbers that are available: Hischier is averaging 16:22 time on ice (TOI) whereas Patrick is only averaging 12:14. Patrick is also only on the ice for 29.5% of his team’s power play time per game with Hischier being on for 42.1% of New Jersey’s. When you look at these two, you’re looking at two players playing in different roles with each doing what their coach is asking. It will be interesting to see how the next five years play out. As the season has progressed, it’s very obvious that Hakstol’s confidence in Patrick has increased significantly. He’s being put out in tougher situations against tougher opponents, and he is holding his own. He is competing well in the faceoff circle at 48.02%, which is impressive for a first-year player. Recently, Patrick was promoted to the second line with Wayne Simmonds and Jakub Voracek which should spark his offensive game. This shows the confidence that head coach Dave Hakstol has in his abilities. Simmonds is having a sound season with 29 points and Voracek is leading the NHL in assists with 47. Playing alongside these two veterans should help elevate Patrick’s game to start producing points. It won’t hurt that he’ll be playing alongside the NHL’s assist leader. We’re going to have to wait and see how this second line experiment turns out. 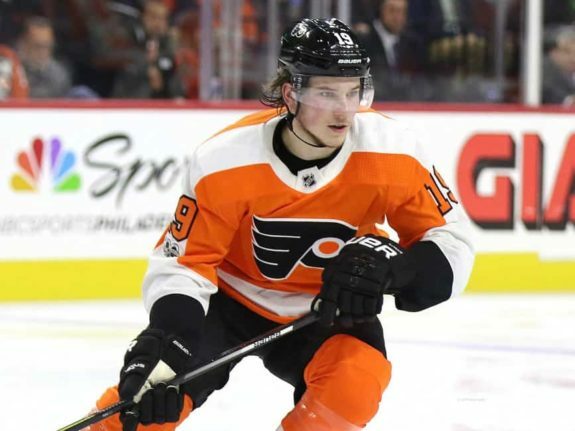 Regardless, if he stays up there or not, it’s impressive to see a first-year player taking the reigns as second line centre on a team with the makeup of the Flyers… and he is only 19! He still has many years to bloom into the superstar that he’s projected to be. After half a year, Patrick is already turning into a fan favourite. The kid has done it all – he’s fought, he’s hit, he’s scored, he’s made electrifying plays and, he comes back into his own zone. He’s a coach’s player and a team player who will do what it takes for the team to succeed. He made a statement in the preseason when he fought David Krejci and earned his teammates’ respect. It takes a special kind of player to be effective without always hitting the score sheet. Patrick is one of those players. He brings all the intangibles to the team and you can tell his linemates like playing with him because he will cover up on defence when needed. He is always looking to set a teammate up (sometimes even when he should shoot – refer to Dale Weise goal above). Players like Patrick don’t come around often, so fans and management need to be patient as we witness the rise of an impact top-six forward. The league is starting to take notice, and they should, because the point production should start picking up as he closes in on the final half of the season.